That’s one of the things we love about being Australian. We’re proud to be ratbags. Ned Kelly was a ratbag with a gun. For a city that has embraced deconstructed avocado smash, food trucks for dogs and every other wanky inner-city trend, Melbourne sure is narrow-minded when it comes to oBikes. The controversial bicycle-sharing service hoped to encourage more people within Melbourne and Sydney to choose riding over public transport or driving. 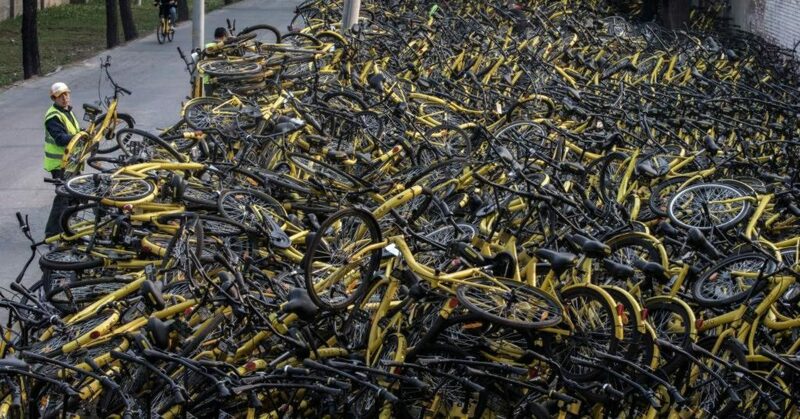 Only oBike wasn’t able to gain traction with Melburnians… As the service requires no physical docking stations, the bicycles can be left anywhere not posing a risk to public safety. Sadly, this meant people started to leave the rental bikes at the bottom of lakes, on bus stops and pretty much everywhere else you would leave them if you were a delinquent. I mean, it’s not like we’re China, right? So… what? The Chinese are larrikins too? You mean we’re not culturally unique? I don’t think this is what’s going on here. I think this is a text book lesson in POWER. Even self-destructive behaviour is often just a giant F-you to the powers of the world – the powers that tell you you should look after yourself and your kidneys, and stay alive. And that’s where the Aussie larrikin streak was born. As a penal colony, we were born into and out of massive power imbalances, and we inherited an instinctive distrust of authority. British commanders were shocked that the ANZACs respected individuals, and had no respect for titles and fancy hats. But while this rebelliousness is more evident in certain individuals, and in certain nations like Australia, it lives in every single one of us. Every human on earth lives with controlling forces. And every ‘citizen’ is by definition, living under some power. Not matter how peacefully and cooperative your own instincts are, you will still feel the controlling hand of the state. And so we all feel a need to ‘push back’ at some point in our lives. We need to recognise this, and recognise that there’s an energy here we can work with… if we can make sure our rebelliousness is channelled into constructive outlets. For example, you hate your job, and your boss is a micro-managing weasel. One rebellious instinct tells you to quit your job and enrol in a property investment masterclass. Another instinct tells you to hit the booze and then make photo-copies of your arse to wall-paper his corner office with. You’ve been working hard on a deal for months. It’s taking longer than you thought, and is asking you to put in late-nights, day after day. Your rebellious instinct kicks in. Do you pull out of the deal and send a photocopy of your arse to your JV partners? Or do you realise it’s maybe time to step away from controlling yourself for a bit. Maybe you’ve been cracking your own whip a little too hard. Maybe its time to start negotiating with yourself more. We are all rebels. Australians made it famous, but its something every human can relate to. The key to a productive life is consciously working with your rebellious instincts. The only people who don’t feel rebellious are the ones who can see no escape from power.